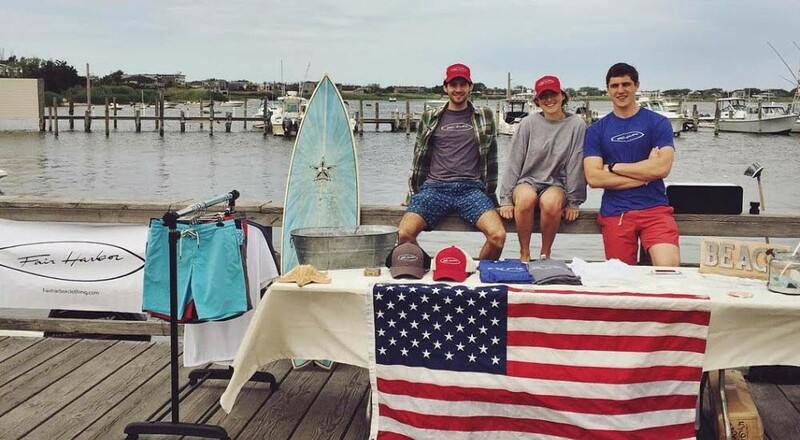 When siblings Caroline ’19 and Jake Danehy ’16 set out to make the eco-friendly clothing line that would eventually become Fair Harbor, Caroline was still in high school, and the idea was firmly rooted in soil, not the sea. “We had an initial idea called Three R Clothing. It stood for reuse, refresh, and revitalize. We were going to plant a tree with every boardshort sold,” said Jake Danehy, a geography major and Division I athlete from Larchmont, N.Y.
As they started looking for suppliers to manufacture their clothing line, they found a specific fabric directly made from recycled plastic bottles. With that, they decided to go in a different direction. Instead of planting trees, they would turn 11 plastic bottles into a single swimsuit, and would donate a portion of their profits from every sale toward cleaning up beach towns along the east coast. Jake and Caroline pitched this idea, Shark Tank style, at Entrepreneur Weekend in April 2015, as one of Colgate’s Thought Into Action Entrepreneurship Institute Student Incubator (TIA) participants. As a result, they received $5,000 in funding. They were then selected as one of six Colgate eFund winners, earning an additional $15,000 and summer work space in Colgate’s dedicated entrepreneur incubator in downtown Hamilton. This funding was used for a down payment on their first order of boardshorts. It was in that space, and at regular TIA workshops during the semester, that Jake and Caroline Danehy were able to tap into the Colgate network, taking in expert volunteer mentorship from Tim O’Neill ’78, managing partner of Golden Seeds Fund 2 LP, and Andrew Parietti ’10 president of Outdoor Voices. By July 2015, the first order of 500 boardshorts was in hand, and by the end of the summer they had sold 95 percent of their inventory. Soon after, the Fair Harbor team started working on their second line, consisting of seven new boardshorts and five new t-shirts, and launched their first KickStarter campaign in December 2015. They hit their initial goal of $11,000 worth of pre-orders within the first 72 hours of launching on KickStarter. “We wanted to make $11,000. We ended up making just under $25,000,” Jake said. Fair Harbor’s next shipment will arrive in March. Jake and Caroline will be managing sales, working on PR and social media, hiring college campus ambassadors, and organizing pop-up shops in local beach towns along the east coast. Colgate’s 2016 Entrepreneur Weekend is slated for April 8. Additional information, including a full schedule and details about this year’s all-star panelists, will be announced at Colgate.edu in February.